Yes, this is my messy desk, covered with notes and textbooks for my classes, books on Latvian language and my coupon organizer with its Duck Duck Go search engine sticker. I’ve spoken in the past about Latvian biezpiens, roughly translated as “curdles.” It’s an essential part of making pankūkas, for one, and several desserts (like biezpiena maize). It’s also completely unavailable to me. You might find it in Brooklyn, maybe. And quark just doesn’t cut it for me. It’s just not the same. Since we can’t easily go to Rimi and buy a pack or beg my mother-in-law’s neighbor for some, we have to make it. I’ve made biezpiens before, but every batch was different and I couldn’t get it consistently working. It also relied too heavily on products that can be expensive or hard to obtain. Creamy kefir cheese, as much as I love it, isn’t dry enough nor is it consistent in its texture, thanks to the lovely little live cultures driving my kefir production, for me to be able to consistently produce a nice biezpiens. We’ve been experimenting with different methods of making it. And now, we’ve finally, finally found a way to make consistent, dry, crumbly biezpiens inexpensively, thanks to an accident while making ryazhenka. Ideally, you need some form of press to press additional liquid out of the curdles when they’re done being strained. If you don’t have one, or can’t rig one up, it’s okay, but they won’t be as dry. Originally, I described my press here, but I’ve decided to break it out into its own post with pictures. Check it out here. We tested two different methods: one with the oven and one with our rice cooker. The rice cooker is definitely our favorite – it’s low, slow and unlikely to cause a mess. I believe that a slow cooker on its lowest setting would also work but please check it often. The oven method is faster but if you move wrong, you’ll splash buttermilk all over and make a huge mess. Be warned. We used one half-gallon plus a quart for the tests and wound up with about a pound of biezpiens, which packed our 1 quart bowl. Plenty, in short, for Jāņu siers and some pankūkas for dinner the next day. Pour buttermilk into the cooker and set it to Warm. Close the lid and wander off for about 90 minutes to 2 hours. Open the lid and check: the buttermilk should have completely separated into a solid mass of curds floating on clearish whey. The top should be springy and dense, the curds somewhat moist but much, much drier than cottage cheese. If it is more like cottage cheese, close the lid and let it cook another 30 minutes. Preheat oven to 300F. Pour buttermilk into a 13×9 casserole or baking dish. Bake for 50 minutes to an hour. The edges will cook faster than the center, so test the center when you check on it. When ready, the buttermilk should have completely separated into a solid mass of curds floating on clearish whey. The top should be springy and dense, the curds somewhat moist but much, much drier than cottage cheese. If it is more like cottage cheese, let it cook another 30 minutes. Line a large sieve or colander with cheesecloth or butter muslin. Strain the buttermilk mixture through it and gather up the edges of the cloth. Wrap the proto-curdles loosely and place into the press. Place weight on top and then chill in the fridge for 24 hours. If you don’t have a press, place the sieve into a bowl and rest a bowl of water or rocks or something on top of the cheesecloth-covered curdles in the sieve. Again, place it in the fridge for a day. Remove the biezpiens from the press. 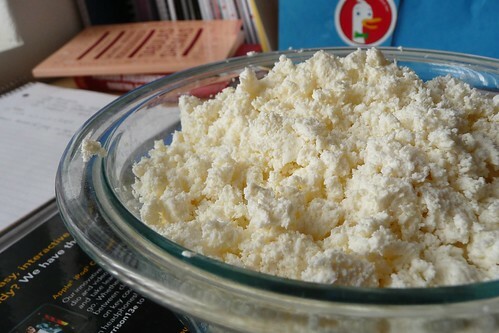 It should now be very dry, very crumbly white curds. It is now ready to be used in pankūkas, Jāņu siers, and other tasty biezpiens-based recipes. These don’t last long, maybe one or two days in the fridge, so be ready to use them up fast. This entry was posted in cheese, gluten-free, latvian, recipes, untranslated. Bookmark the permalink. 4 Responses to Biezpiens, refined. Fascinating Cori but I can’t imagine what your press looks like 8) Would it be possible for you to post a photo? You mention biezpiena maize. I have been looking for a recipe for some time and not been happy with any so far. Would you have one? I’ve recently been able to source some biezpiens but unfortunately it is in Melbourne where our daughter lives (about 1 hour by plane)! Still, every time we go to visit I bring some home in a cool pack. The people who make it sell it as Polish Style Cottage Cheese. Obsessive? Probably. Of course! I’ll take some photos of it in the morning and update the post. As for biezpiena maize, I have two recipes from my trusted Latvian cookbooks that should work. I haven’t made either yet (though I’m going to soon! ), so I can’t speak for which one to follow. I’m sorry, I don’t mean to be rude, but do you speak fluent Latvian? If so, I’ll just scan what I have and send it over to you in the morning, otherwise it’ll take a day or two for me to translate them. You’re lucky that she’s only an hour away! I’d love to bring back some from Latvia, but the 36-hour endeavor (and customs) defeats me. Plus, I think customs would take issue with me bringing back some biezpiens from my mom-in-law’s neighbor — hell, I can’t even have raw cheese in my state, much less raw milk products from overseas. No good buttermilk?! Yikes! Maybe you need buttermilk cultures? Poppy Filled Ring Roll… or something. With the rise of allergies and alternative diets, it can be really challenging to find recipes that fit your needs. Here are some tips to help you with recipes on my site. * All of my recipes that call for any type of bread cubes or crumbs will work with gluten-free breads. * Many of my salads call for sour cream and mayo - they originally called for all mayo. You can also use fake sour cream or vegan sour cream. * Baking recipes that call for butter can use margarine, cooking recipes can use oil. * Recipes marked with dairy-free, vegan or gluten-free can either have offending ingredients substituted or omitted. * Usually milk and half-n-half can be substituted with soy, rice, coconut and other nut milks.